Setting and achieving goals is an important part of life. Without goals, it’s impossible to assess where you are and where you want to be. Whether you’re planning for the long- or short-term, goals require tenacity and perseverance. 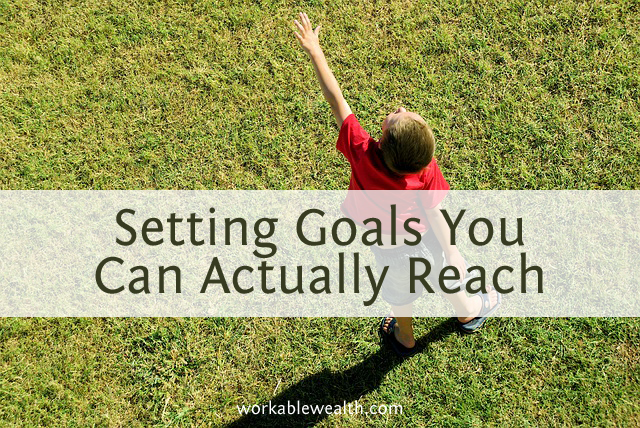 Financial goals often require a longer timeframe than other goals, but even big goals are within your reach. Like any accomplishment you want to attain they require dedication and patience, but the payoff is substantial. Here’s how you can create money goals that you can actually reach. Setting attainable goals starts with getting SMART. This is a useful acronym to keep in mind when dealing with money goals. It gives you an easy-to-remember formula for choosing achievements you can reach. Measurable – How will you evaluate your progress? If you can’t measure what you’ve done, it’s hard to know when you’ve actually achieved your money goals. Attainable – What are you going to do to successfully achieve your goal? Will you need to pick up a second job or reduce your expenses? Consider what you will need to do right now to achieve your goal. Time-related – Specify when you want to accomplish your goal, whether it’s 6 months from now or ten. Without a deadline, a goal is just a dream! By defining your goal with the SMART formula, you’ll have a clearly defined action plan that gets you closer to achieving your goal. And you can apply SMART to any goals you have, not just financial ones! Consider your future plans when making goals according to the SMART formula. Almost every goal you have requires financial resources, even if your goal is to eventually live off-the-grid in a tiny house. This is when it’s important to set both short- and long-term goals. Short-term goals include any goals you want to accomplish within the next 5 to 10 years. These goals could include saving up to go back to school, buying a new home, or starting a family. Setting short-term financial goals is important because it keeps you focused on the near-term future. If your goal is to get your law degree in the next 4 years, you’ll need to focus intently on budgeting for your tuition as well as saving for living expenses if you need to quit your current job. Long-term goals include anything you want to accomplish 10 years and beyond. This includes retirement, but also saving for your children’s schooling, or owning your own business. Planning for long-term goals can be easier, as you have a longer timeframe to save and make adjustments as you need to. However, it’s also easier to get distracted along the way. While staying motivated over the years to achieve your financial goals can be tough, it’s not insurmountable. By breaking down your goals into bite-sized pieces and setting regular check-ins on your progress, you’re more likely to see consistent rewards. Setting small, measurable goals is key to keeping yourself motivated. Your consistent progress will prove your hard work is paying off! If you’re following the SMART formula, you already know how important it is to analyze your progress toward your goals. However, life has a funny way of throwing curve balls at us that sometimes cause us to get off track. It happens, but there are definitely ways to handle these deviations. Prioritize – Make sure to prioritize your goals over any other distractions. Ask yourself what is more important: your short-term goals of owning a house, or spending money on X? Automate – One of the secrets to staying on track for your goals, particularly for long-term goals, is automation. By setting up an automatic direct deposit from your checking account into a savings account, your savings is taken care of for you! This saves you the extra step of having to manually take out your savings and reduces the risk of you spending your money ahead of time. Track – Consider creating a regular tracking system for your financial goals. This includes using Personal Capital, Mint, an Excel spreadsheet, or even a low-tech pencil and paper spreadsheet to monitor your progress. By tracking your goals, you’ll be able to quickly see your progress and whether or not you’re achieving those bite-sized goals you set for yourself. It almost goes without saying that one of the most important qualities to have when setting goals is patience. Working toward any goal that takes a while to complete requires a dogged determination, but that’s not to say you shouldn’t celebrate small victories. Every once in a while, lean back from the day-to-day and take a look at your big picture. If something isn’t working for you, now is the time to re-evaluate your SMART goals. Is there another way to tackle this goal, or can you adjust the timeframe? Giving yourself the ability to lean back and take a fresh look at goals will also help keep you on track. As you accomplish your short-term goals, congratulate yourself and celebrate a little! Achieving goals isn’t something that happens every day, and you deserve a pat on the back for following through. Then propel yourself into setting and seeing through another round of successful financial goals.